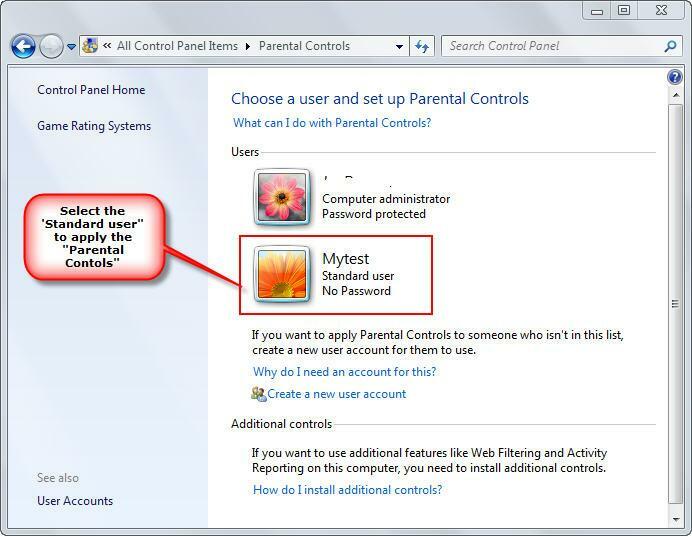 Parental Control in Windows 7 is a useful utility to control the access of programs that are installed in a computer. Some of the applications like games can be restricted for the children's. You can restrict the access of such applications and games by blocking the program installed in the computer. Windows 7 parental control is used to restrict games or restrict the login access to the computer on certain time. 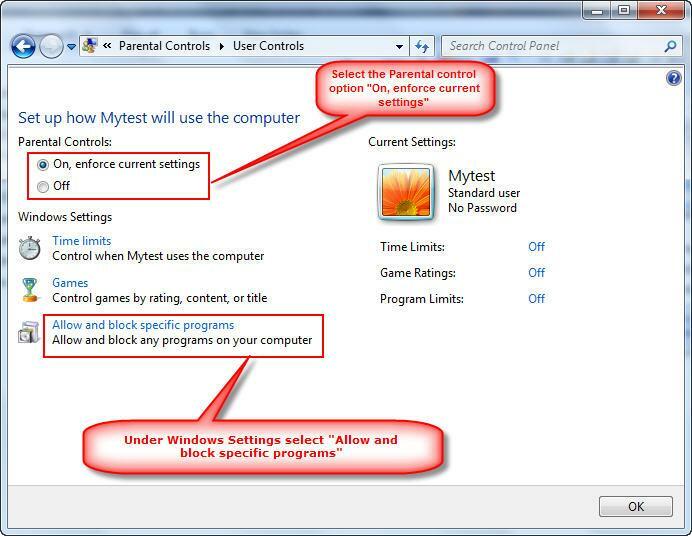 Using Windows Parental Control you can allow or block specific programs or all the software installed in the computer. 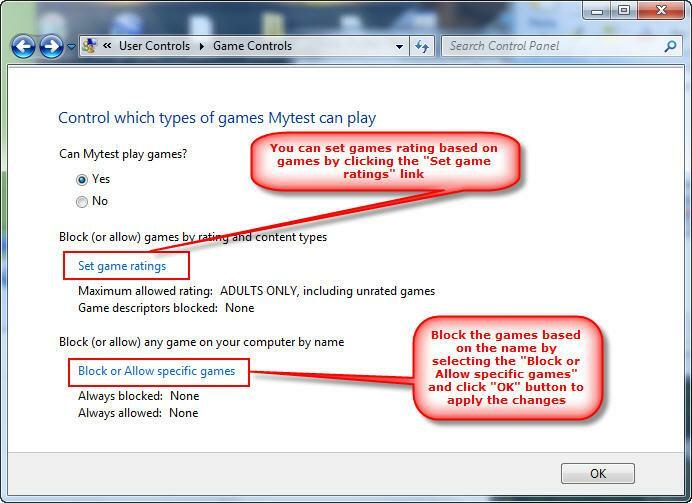 Windows 7 allows us to block the access of the specific applications or games by using the Parental Controls. In order to allow or block the programs the parental control requires elevated permission. Admin users can restrict the access to programs, games, specific time to use the computer. Parental control allows us to set specific time limits to login in to the computer. Even you can set different timings on each day to use the computer for a week, if the user is logged on the system on the restricted time then the system will automatically logged off. Using parental control you can control the access of the games by choosing the age level and you can block the unrated games too. Open Control panel and then select All Items view will show all the control panel items. Select the On, enforce current settings to on the parental control to the selected user. 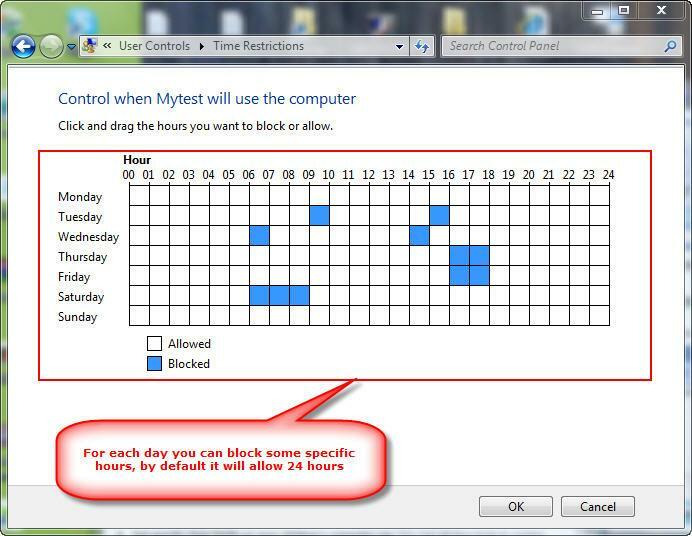 Under Windows Settings you can select Time Limits link will open Time Restrictions windows to restrict the access to the system by the select user on certain time for the whole week, for each day you can select different hours to login to the system(Check the below image). It will open the Application Restrictions window and you select the first option to allow all the programs for the select user or you can choose which program the user can allow to run. 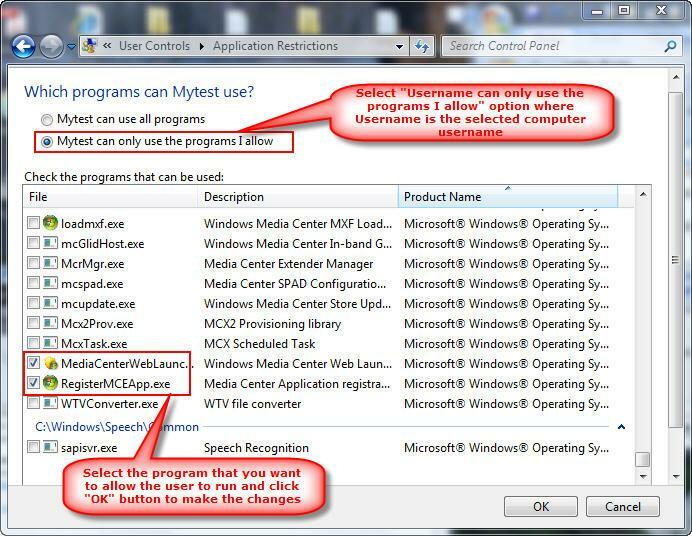 Once the second option is selected then it will list all the programs that are installed in the computer and you can choose the program which you want to give access to run and click OK button to apply the changes to the user.